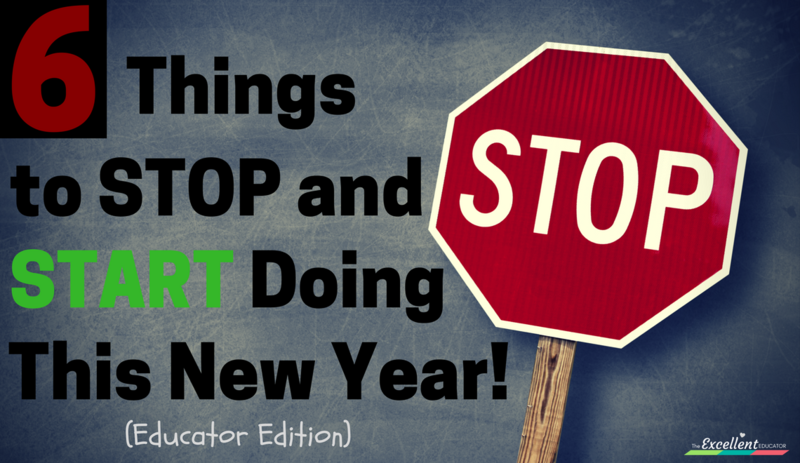 6 Things to STOP and START Doing This New Year! Happy New Year to some of my favorite people!!! The holidays are over and a new year is upon us. It’s really crazy to think that it is 2018…wowzer! I hope last month’s post helped give you a halfway strategy for your Christmas break and you feel ready to tackle the second semester! This month I want to devote both of my posts to you and your well-being! If you have been following me on Facebook or Twitter or have attended any of my classes, then you know how much I am an advocate for teacher self-care. It is my hope that this year will be the year of YOU…meaning you will invest in YOU like never before! I realize that this is something that is often foreign for educators. We tend to take care of everything and everyone, while we get put on the back burner. In fact, this self neglect becomes quite natural. The good news is that there is hope. It doesn’t have to be this way. It took me a while to create a change for myself and focus more on me, but I finally learned how, and I want to help you start the “you journey” that you deserve! 1. STOP letting negative talk influence you! Negativity is contagious and unfortunately easy to find these days. It’s actually more common to find negativity than it is to find positivity! If you turn on the news, social media or just listen to people’s everyday conversations, we are constantly inundated with negativity. In fact, some people have a tendency to allow the negative they see, to shut out any and all positivity. It’s important to recognize and avoid being around this. If you allow negative people, or even negative talk to be around you for too long, you will eventually begin to take on a negative outlook yourself. Now don’t get me wrong, we all have bad days and frustrations. You can’t go through this life and never experience difficult times but our focus should always be redirected to the positive. I always remind myself that every day may not be good, but there is good in every day. If we neglect to focus on positive things, rehashing negativity will soon burn you out and create a maximized frustration level that can quickly lead to discontentment. This is SO important for teachers. If there are teachers who constantly focus on what administration isn’t doing, or what isn’t going right, just try flipping their perspective and pointing out something positive or something that is going well. There is power in your perspective and you will be surprised at just how different you will begin to feel when you limit the negative talk around you and shift your thinking! You can always find the positive in any situation… if you just look for it! 2. START adjusting your mindset! Your mind is a powerful thing. It’s actually one if the most powerful things we have as human beings. I once heard TD Jakes say, almost everything that you ever achieve happens in your mind first. That really made me think and process different scenarios. So if this is true, that means a successful person is successful in their mind before it’s a reality to them. Hmm….🤔 That would also mean that a teacher is a teacher in their mind before they have their credentials or their own classroom. I completely agree! When I thought about my own life, and things that I have done or achieved, I can honestly say it was decided in my mind, before it actually happened. I envisioned myself as a teacher, way before I finished my degree or got hired. Before I stepped out of the classroom years later, I remember making up my mind that I wanted to support teachers in some capacity. This concept is even true for things that I had no idea I would do – like blogging! Don’t judge me but until 2016, I never had hopes of becoming a blogger or even having my own website. It wasn’t until I kept hearing teachers ask me to create something online that I began to flirt with the idea. Initially I thought, no way…me? But eventually I made up my mind that I could do it and I made it happen! This was just more proof that backed up the theory that almost everything you achieve happens in your mind first. I had to become it in my mind and then my actions followed. What do you want to achieve or become this year? Is there a new skill you want to learn? Are you striving towards something? Are you wanting to be more successful at something? Half of the battle is making up your mind to do it! Your mindset is also extremely important. A mindset is an established set of attitudes. You can decide to become something but to continue being that, will require a certain mindset. Let me illustrate how your made up mind and your mindset work together. I can decide in my mind that I will be a successful teacher and become that, but in order to remain that successful teacher, it will require a certain mindset to persevere and maintain that success. The best mindset to have as you work towards anything is a growth mindset. Carol Dwek coined the phrases “fixed mindset” and “grow mindset” about 30 years ago to describe the underlying attitudes and beliefs about learning and intelligence. A growth mindset is one that believes abilities and intelligence can be developed. A fixed mindset believes the opposite. A fixed mindset believes that abilities or intelligences are fixed traits. Dwek found that a growth mindset actually leads to motivation and achievement and many other things. 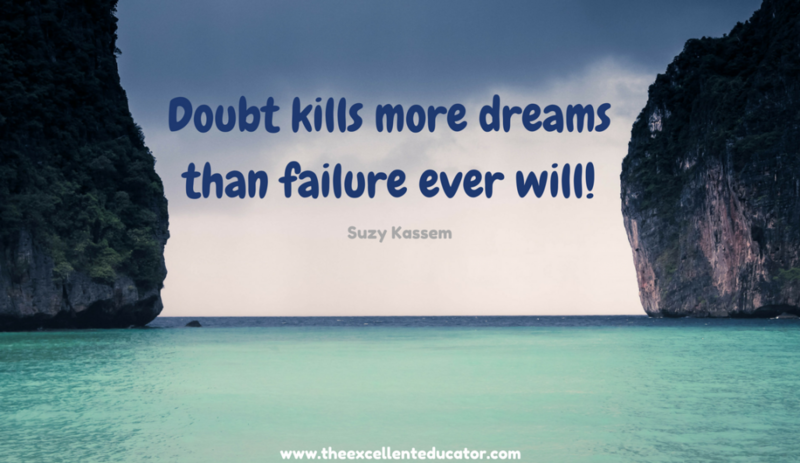 In recent years there has been a huge push for teachers to teach and establish a growth mindset in students since there are such great results from it. What I haven’t seen is a big push for teachers to adopt this growth mindset themselves. A growth mindset has shown many benefits including lowering stress and anxiety, building resilience and confidence and increasing growth and performance. This is exactly what educators needs! Here are some examples of what someone who has a growth mindset may say or think. Start being intentional and adjust your mindset to always think growth. I am certain it will yield results! 3. STOP being a one person show! It’s not the size of the load that breaks you down, it’s the way you carry it. I try to include this quote in most of my workshops because it’s a concept that can really help teachers. It’s no secret that teaching is hard work. It’s a heavy load. Depending on how you carry that load determines if or how it breaks you down. If you are doing everything solo like you are a one person show, then I bet the load is wearing you down drastically. Teachers are being pulled in so many directions and asked to do so many things these days, so one of the best ways to carry this load, is to find a network of teachers who are what I called equally yoked educators. Equally yoked educators are equally passionate, equally driven, equally creative, equally hardworking and match your teaching style and beliefs. By finding a network of equally yoked educators, you can divvy up the load and carry it much better. Wouldn’t it be nice to not have to make all of your own lesson plans or plan all of your center activities and topics of study? A strong network will allow you to share lessons, newsletters, ideas and much more – only requiring that you tweak it to make it your own. A network doesn’t have to be large. It can be 2 people or 20 people. They can be teachers on your grade level in your school or teachers who are at a different school that teach your same grade level. Find or create an equally yoked network so you can start sharing your load before it breaks you down. A good support system is key to making anything in life easier to manage! 4. START investing in yourself ! Usually when people hear the word investment, they think about fiscal investments where you put money into something and expect a greater return. While this type of monetary investing is wise, personal investment is also wise. Investing in you can means a couple of things. It means spending time working on things for yourself that will yield a return. For some people it might be going back to school, getting an additional certification, learning a new skill that will be beneficial or taking time out to do a hobby you enjoy. Investing in yourself also means planning you time (yes, even in your busy schedule) to rest and do things that rejuvenate you or make you happy. What pops in your mind when you think about a personal investment you need to make? Only you can decide. That thing or thing(s) that just popped in your mind…. The time is now to make a plan and do it! Why wait? If you wait for someone else to invest in you, it may never get done. 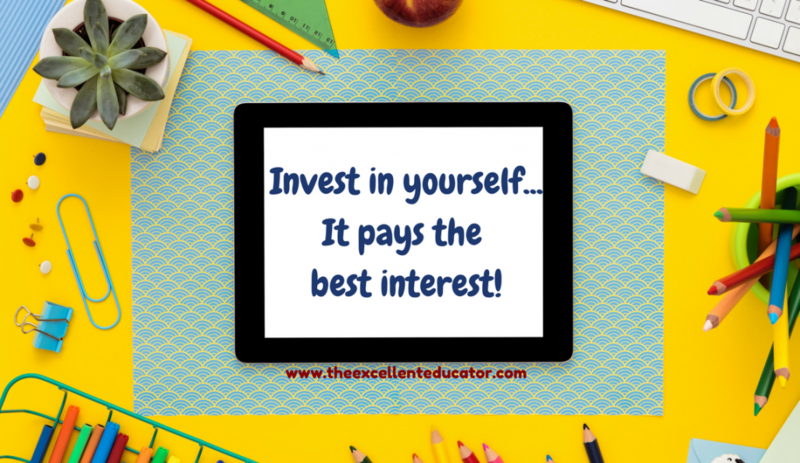 Whether its professional development or something personal that is completely disjoint from your professional life, it’s time to invest in you, the same way you do your students and others! You owe it to yourself and after it’s all said and done, you will thank yourself too! Self doubt is that small inner voice that always bets against self. It often whispers things to you like, “You’re not good enough, educated enough, _________ enough (fill in blank with the last thing it’s whispered to you).” It will say things that will make you second guess yourself and it can even stop you in your tracks from trying something new. No matter what this small nagging voice says, just know it’s all lies! If you’re not careful self doubt will hold you back and talk you out of doing the very thing(s) that you know you’re supposed to do. Even though I faintly heard the self doubt, my drive would allow me to still push through and excel. Every time I succeeded, I would look back and realize that the doubt was nothing more than a silly distraction. One day I decided I needed to drown out the doubt and let faith override fear. I learned that self confidence is an immediate silencer! Now, when the inner doubt asks, “What if things don’t go as you planned?” I confidently ask in return, “What if it goes better than I planned? !” Adopting this attitude and the decision not to believe the doubting thoughts, has done wonders! The next time you hear that inner whisper that bets against you, choose to boldly answer back with confidence. No matter how many times you hear it, be prepared to reply with a confident counter. You will shock yourself with what you can do when you believe in yourself and walk in confidence! 6. START maintaining your motivation! The final thing that I want to suggest you do in the new year is to start maintaining your motivation. Our motivation is the reason behind why we do everything. Everyone has different motivation factors but we are all motivated by something. When people decide to adopt a healthier lifestyle, some people are motivated by the outcome of weight loss. Some people are motivated by the idea of getting into a bikini for a summer trip. Other people might be motivated to decrease their risk for health issues. Although three different people may decide to do the same thing, their motivation to do it can differ. When you first begin something, your motivation level is usually the highest. As time goes on, your motivation can decrease. This is why many people set goals and start strong but eventually fall off and don’t follow through. Motivation can be short lasting if you don’t maintain it. Here are three steps to maintain your motivation this year. Remind yourself of your why DAILY or as much as you need it! Figure out a few things extra things that serve as “motivation maintenance” for you. These are things that help ignite and maintain that motivation level you need to follow through. I have several things that serve as my motivational maintenance. Sometimes I read motivational things, listening to motivational podcasts or listen to music that motivates me. Sometimes my motivational maintenance is self talk or having a support partner who motivates you or reminds you of your why. Whatever you decide to do this year or not do this year, will require continued motivation if you’re going to stick to it. I’m here to tell you…you’ve got what it takes, so go live your best life this year! Thank you for your light of positivity and enlightenment. You empower so many people and this list was a much needed resource that can be used as a reminder that we all have a purpose. Thank you Kara. I saw the light of your words and will incorporate this in my day to day.